Customer Appreciation Day on January 16th! Beverly's owes everything it is today to its outstandingly wonderful customers. Stop by on Saturday, January 16th for a great day of savings and lots of fun... all in your honor! *Must enter the drawings at one of our locations. Find your nearest Beverly's now. NEW Yarn in Stores Now! The holidays may be over, but the cold weather isn't. There's still plenty of time to knit a little something for those with a January or February birthday. 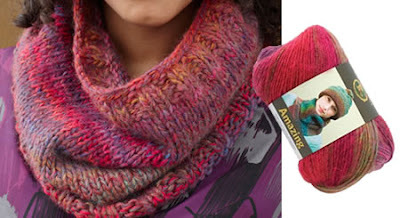 Try this new yarn from Lion Brand called Amazing. Mimicking the look of an expensive, hand-dyed yarn, the subtle patterns and shades that emerge as you work are truly Amazing. It has a soft, brushed texture and a lightweight construction that is warm, without being heavy, making it ideal for garments and accessories.